Chewing on the Upscale Restaurant Lease, and the Lease Clause Critique: A Close Look at the Build to Suit Restaurant Lease. 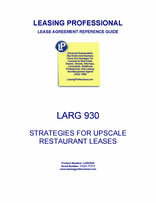 This LARG focuses upon leases for upscale restaurants located on regional shopping center pads. The first section serves up a number of critical issues for this type of transaction which both the landlord and the tenant should consider. The Lease Clause Critique looks at extensive excerpts from a restaurant lease for a shopping center pad. The deal calls for the landlord to build the improvements using the tenant's plans subject to a maximum construction cost. The rent for the deal has three components: a stipulated rent for the pad, rent based upon the cost of the building, and percentage rent. Regional shopping center pad sites are ideal locations for full service restaurants due to the visibility and traffic normally produced by such shopping centers. But such upscale restaurant deals require expensive improvements, full liquor licenses, and are risky to operate profitably on a long term basis. Such operations often must be located upon a prime pad for the center. This tends to magnify the importance of the deal—if the restaurant succeeds, it is a great draw for the center. If it fails, it is an expensive mistake that turns into a dark eyesore for the landlord. Both the landlord and the tenant have lots at stake—what's the best recipe for a tasty deal? Turn-Key Deal. If the landlord wants to be in charge of construction and can finance (or otherwise pay for) the development of the building and the site, the parties often negotiate a turn-key deal, where the landlord builds the restaurant using the tenant's plans. There would usually be a maximum on the landlord's share of the construction costs, and the minimum rent would be based upon the cost of the building plus some stipulated amount for land value. The term "turn-key" refers to the fact that after the landlord finishes construction of the building, the tenant merely "turns a key," and opens to the public. Construction Allowance Deal. If the tenant wants to control construction, it can elect to build the building on the shopping center pad, and negotiate a construction allowance from the landlord. Sometimes the allowance is payable in progress payments as the project is completed; sometimes it is paid as a lump sum after final completion of the building. Is the tenant's architect preparing the plans for the improvements? If so, is the tenant's architect locally licensed, so that he can stamp the plans and be knowledgeable concerning local building codes, etc.? How much time will the landlord have to review the tenant's plans, and how much time will be available for modifications if the landlord requests them? Are the mechanics for the payment of the excess construction cost (i.e., any amounts in excess of the landlord's maximum construction amount) well covered in the lease, so that they will be paid by the tenant within the time periods required by the landlord's construction contract or by the landlord's lender? Is the landlord required to assign any construction or equipment warranties to the tenant following the completion of construction, so that they will be available to the tenant when it maintains the premises? If the tenant's construction contract provides for progress payments to the contractor, do the mechanics for the construction allowance permit partial disbursements of the allowance contemporaneously with the progress payments? Is the documentation for collection of the allowance (i.e., partial waivers of lien, certificates of completion of various portions of the work, etc.) reasonable for the tenant and its contractor? Can the tenant finance or pay the balance of any excess construction costs not covered by the allowance as required by the construction contract without timing problems? Is the tenant required to open for business before the final portion of the allowance is payable by the landlord? After the completion of the improvements, is the rent free period specified in the lease adequate for the tenant's fixturing and stocking of the premises prior to opening?